At the end of those questions, however, the three expressed support for the proposal, which will shift students from Malcom Bridge Elementary School and Rocky Branch Elementary School to accommodate the new Dove Creek Elementary School on Hog Mountain Road in the west of the county. The Board is scheduled to adopt the plan at its next meeting on Nov. 13. The Board also heard at its meeting on Monday that the system’s Educational Special Purpose Local Option Sales Tax, or ELOST, is producing less revenue this year than last and is likely to fall short of the $33 million originally projected. Brook Whitmire, chief human resources officer for the School System, reviewed again on Monday the main features of the redistricting plan, originally presented to the Board on Sept. 18. Students living northwest of U.S. 78 and currently attending Malcom Bridge Elementary or Rocky Branch Elementary will go to the new Dove Creek Elementary School now under construction. The School will open for next academic year. In addition, 52 students living along Rocky Branch Road or off Mars Hill Road now going to Malcom Bridge Elementary School will be moved to Rocky Branch Elementary School. Whitmire said the School System has received 78 comments on the Plan via a portal on the System’s web site. In addition, Whitmire estimated that approximately 50 persons attended the Listening Session held at North Oconee High School on Oct. 10. The 11 people who spoke were against the transfer of those 52 students from Malcom Bridge Elementary to Rocky Branch Elementary. Board Chair Odom asked Whitmire to confirm that no neighborhoods were being split by the plan, and Whitmire offered that confirmation. Bagley wanted to know if the plan was consistent with the System’s Strategic Plan. Whitmire said it was. The goal is to have no more than 750 students at any elementary school, Whitmire said. The projection is that, under the plan, Rocky Branch will have 440 students next year, Malcom Bridge will have 434, and the new Dove Creek will have 488. Rocky Branch is currently at capacity of 750 students, and Malcom Bridge has a capacity of 600 students but has 646 students. Whitmire told the Board that the plan would allow students moving into the fifth grade to stay at their current school, if their parents provide the transportation. If all of the students took that option, Whitmire said in response to a question from Burgess, Rocky Branch would have 491 students next year, Malcom Bridge would have 464, and Dove Creek would have 410. 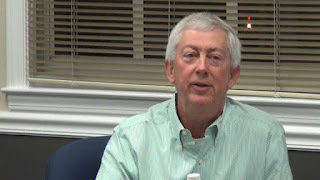 If the 52 students being moved from Malcom Bridge to Rocky Branch were allowed to stay at Malcom Bridge, and all of the incoming fifth graders moved to the new school according to the plan, Rocky Branch would have 388 students and Malcom Bridge would have 486 students, Whitmire told Burgess. If fifth graders and the 52 other students did not move, the range could go anywhere from 388 to over 500, Whitmire said. Under the current draft plan, the number of years the three schools would be able to go without reaching capacity is at least 9 for Dove Creek and Rocky Branch and 7 to 8 for Malcom Bridge, Whitmire said. If the 52 students were allowed to stay at Malcom Bridge rather than be moved to Rocky Branch, the time to reaching capacity at Malcom Bridge would be 1.5 to 2 years less, Whitmire said. “One other thing I would mention to you, Board Members, is that staffing will be impacted by this plan, obviously,” Whitmire said. “We’re looking at two schools that are having students redistricted. Board Member Kim Argo was absent, and Board member Amy Parrish did not question the Plan. “The disruption that building new schools and redistricting, by definition, is going to cause some consternation, but it’s going to be the impact that we’re going to have to manage and deal with as a community if this county is going to grow,” Burgess added. Saranna Charping, chief financial officer, gave a report to the Board on collections across the five years of the current ELOST, which will end on Dec. 31. A continuation of the 1 percent sales tax to begin on Jan. 1, 2018, was approved by voters a year ago. The current tax has produced positive growth year-to-year since it started in 2013 until the current year, Charping said. The tax showed modest growth the first three months of the year, but revenue was sharply lower in April compared with a year earlier and has been slightly positive from July to October. With two collections remaining, the total revenue generated by the tax is $30.9 million. Charping had no explanation for the drop in sales tax revenue. 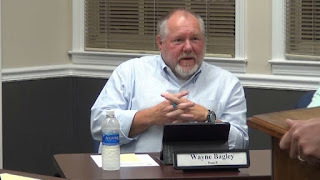 The video below is of the meeting of the Board of Education, held in the Board meeting room of the Superintendent’s Building in Watkinville. Whitmire began his presentation to the Board at 16:30 in the video. Questions and comments of Board members follow. Charping made her report on ELOST at 49:09 in the video. OCO: BOE 11 6 17 from Lee Becker on Vimeo. Attention to the school board meetings is very welcome. Since the "public comment" slot is extremely censored and the meetings are highly choreographed, citizen attention to the board in charge of most taxes paid and spent in the county and state is abysmally low. The audience is mostly staff or students getting awards, while the taxpayers attending is usually in single digits. Meanwhile, administration enjoys luscious salary and benefit packages going on innumerable retreats and meetings while teachers struggle getting their whiteboards fixed. The teachers in the trenches are not as happy as advertised. Greater citizen attention, especially attendance at the meetings where the spending the lion's share of their taxes in the most important function of local government, must be increased.